The Approved Funding Annual Super Bowl Contest is back again by popular demand! Enter your prediction below on WHO will win and by HOW much! 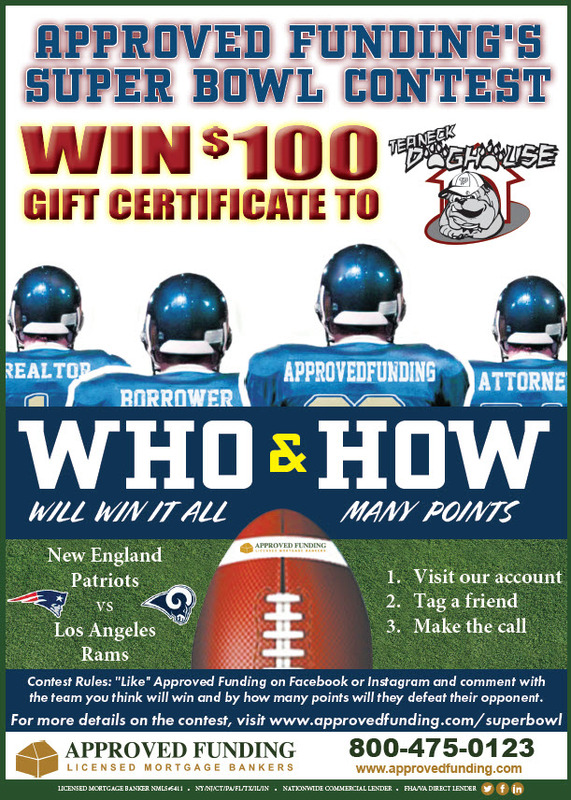 Win a $100 Gift Certificate to The Teaneck Doghouse ! 1. Like ApprovedFunding on Facebook or Instagram and like our SuperBowl post. Dislaimer: Void where prohibited. This promotion is not affiliated with Facebook or Instagram. Only 1 entry submission per user account. You cannot have different predictions on Facebook and Instagram. “WHO” & “HOW” are questions that we at Approved Funding frequently ask our clients and business partners to get more loans closed! You see, at Approved Funding our objective is to better learn about the unique needs of our clients upfront, so that we can make better decisions in getting these loan approved, and at a faster pace than others in the industry. WHO is it that we are working with? HOW will this new mortgage benefit them? WHO needs special assistance? HOW much assistance is needed? WHO else can help with payments? HOW will this impact their financial wellbeing? The list goes on and on. Approved Funding prides itself on “relationship lending” to get more mortgages approved and closed with the lowest rates & fees possible. Contest Rules: Contestants must “Like” Approved Funding on Facebook and remain in “Like” status for a minimum of 90 days after the Super Bowl. Individuals who currently “Like” Approved Funding are eligible. In the event that more than 1 person correctly identifies both the winner of the Super Bowl as well as the amount of points in which they defeat their opponent, all winners will be entered into a raffle where 1 person will be randomly chosen as the winner. Latest time to participate is at the coin-toss on game day. Only 1 entry per person/per like. Give us a call to see HOW we can help WHO!